In the early summer of 1298, King Edward I of England, the redoubtable 'Hammer of the Scots', assembled a huge army and crossed into Scotland. His express aim was to avenge the defeat at Stirling Bridge the previous September and to restore English control north of the border. By the early days of July they had reached Linlithgow and though seriously short of supplies, and racked by internal dissent they advanced towards Falkirk on hearing that Wallace's army was nearby. 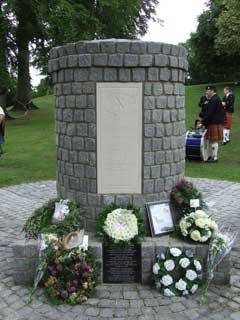 Records show that in Edward's pay that day there were over 14,000 soldiers and, along with one hundred and eleven noble families with all their retinues of foot and horse, made up a huge force, perhaps 15 to 20 thousand strong which faced a smaller number of Scots, possibly 12,000 in what must have been one of the biggest land battles ever fought on British soil. 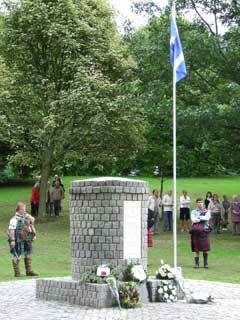 On 22nd July 1298 the two armies came face to face near Falkirk but where the clash took place remains something of a mystery. Over the years antiquaries and local historians using the few clues available have suggested a number of places but without agreement. Tradition, for what it is worth, places the centre of the battle in the area of the present Victoria Park and street names like Wallace and Campfield remind us of the connection. We know from the few eyewitness accounts that the Scots were drawn up on rising ground with the town of Falkirk behind them and that they were separated from the English by a stream or an area of muddy ground, or both. This would fit two of the current favourite sites, the Mumrills farm area opposite the Beancross Restaurant and the land on either side of the Hallglen to Redding Road near Woodend Farm. In both cases the rising ground is present and the Westquarter Burn provides the water course and muddy ground. We know quite a bit about the conduct of the engagement itself which was to prove such a disaster to Wallace and the Scottish cause. The English knights formed columns led by the King himself in the centre, the warlike Bishop of Durham, Anthony de Beck on the right and the Earls of Lincoln, Norfolk and Hereford on the left. The Scots were drawn up into three or four great schiltroms - massive defensive circles or 'phalanx rings' as they are sometimes called - bristling with twelve foot spears, for all the world like giant porcupines. Behind them on the high ground were the Scottish horse though their numbers were few. 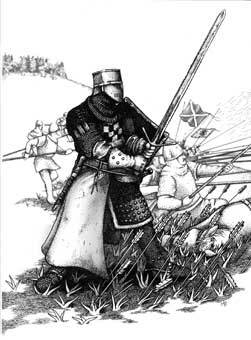 The English attacked repeatedly using knights on horseback to weaken the schiltroms but the Scots held. 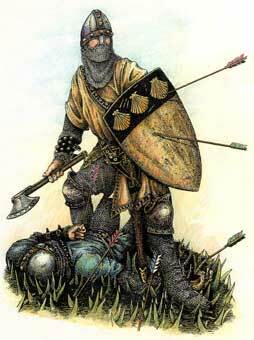 Though they failed to dislodge the Scots main defence it would appear that both the Scottish horse and archers encountered the charging knights and were destroyed in the early part of the encounter. At this critical stage Edward called up his archers, whose longbows would later win the honours at Agincourt and Crecy, but who were now put to the battle test for the first time. Wallace looked to his horsemen to scatter them but found that they were no longer there. We do not know if this was because of the action of the knights already described or for a more sinister reason. 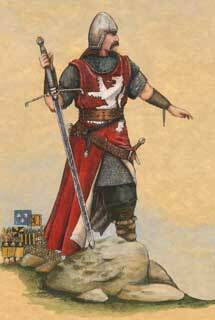 Certainly some some have suggested that many of the Scottish nobility were unhappy to be under the command of Wallace whom they though a man of lower rank and withdrew deliberately at an early stage. Whatever, the Scots were doomed. Great swathes were cut in the rings as wave after wave of arrows pierced the defence. And now the knights could do their worst on the open and dispirited Scottish ranks. The rout followed quickly and Wallace with many of his men fled north and east towards the Carron and the relative safety of the Torwood. Many hundreds, perhaps thousands, did not escape and they were finally buried in common pits near the field of battle as was the custom. They have never been found despite seven centuries of agricultural and industrial development. .